Recently I joined yoga classes to learn hatta yoga from my guru Dr. Abhay Kesthe. I was always attracted to hatta yoga (yoga involving intense postures). Soon opportunities manifested in itself with my friend Krishnaprasad telling me about B.K.S. Iyengar Yoga being run here locally by Dr. Abhay Kesthe. Soon we both found ourselves within his premises and learning this great art. Shri. B.K.S. Iyengar, who turns 91 this year, is one of the foremost teachers of Yoga who innovated and brought yoga to the common masses with the use of props like belts, bricks, bolsters, ropes, etc. He is known throughout the world for his yoga disciplines and lives healthy and still practices yoga at the age of 91. He brought the difficult hatta yoga within the reach of the common man with the use of his own modified and innovated techniques and postures using various other aids to help one start off with. He is well known for his no-nonsense attitude and devotion to the yogic practices for physical as well as spiritual nourishment. He runs institution s in all the parts of the world. He currently lives in Pune. Unfortunately due to our other schedules, me and KP are not able to join our class collegues on Dec 14 and 15th as they plan to leave to meet guruji for his 91st birthday in Pune. But, we have hope to meet guruji during our Maharastra tour somewhere during the later part of December, 2008. My guru Dr. Abhay Keshte is a direct disciple of Shri. Shri. B.K.S. 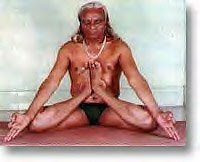 Iyengar, and I am happy to have met him through some or the other form that brought me in touch with this yoga. It is a great time from 6:15 to 8 am everyday with him where he demonstrates the asanas on the platform as we all follow his guidance. My guruji has been into yoga for more than 15 years now and runs two institutes in Belgaum under the name "Shrikant Yoga Center". Moments after our class he does stop in to talk a few casual words with all students. You can see him here in this picture in black outfit which was taken during one of his class earlier in Belgaum. Nice to see your comment here and you are the senior most person there, from whom I have learnt yoga too. After guruji, it has been from you whom I learnt. Thanks. This site is updated regularly. Hoping to see you on Monday and here at this site as well! Stay blessed!